Fresh & flavorful! !Absolutely delish!! Bought all 3 flavors - Garlic, Jalapeno & Chili Lemon. Not too spicy at all, just pure perfection!! We will only buy from YUROSEK!! Thanks for such a delicious product!! Happy Holidays!! 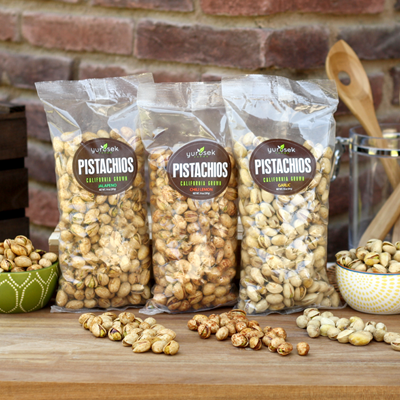 I have tried many sources of pistachios and Yurosek Farms is the best for consistent quality. Look no further. We've tried a bunch of other brands from local stores to buying from other farms. Well, we are back to Yurosek farms. Oct 14, 2018 | By Steve A.
I just got these on Friday and my family has almost destroyed the whole batch! These taste fantastic! The jalapeno are just salty and spicy enough, the sweet chili are addictive, and the garlic will make you smile in bad breath bliss! Owner Response:Thank you Marqui for being a valued customer! I wasn't sure how I would like the spiced pistachios, but this is now my guilty pleasure. Owner Response:We are so glad you like them!! The flavor these things pack is awesome! I loved all three spiced packages. Done right, with the salt and spices crystallized inside the shell case resulting in big flavor. The only thing I would add is to try and reduce your shipping costs and I would by these much more regularly. Otherwise would have given five stars.